Champions League or the EPL: A Soccer Trophy Tossup? Riffing off one of the topics briefly touched by TCB’s readers and myself from my first article, I’d like to try to dissect the whole European football league title/Cup/Champions League mishmash championship system, and contrast it with the somewhat more straightforward system of elimination playoff tournaments used by most American professional sports leagues. One of the consistent phenomena among soccer fans seems to be the lack of agreement over whether winning the Champions League or a domestic league title is the more prestigious accomplishment. In both scope and format, the two competitions could not be more different. A domestic league title rewards a team that plays consistently well throughout an entire season, and places equal weight on each individual match. The Champions league rewards teams that treat every match as a do or die situation, with the exception of the group stage. The league title format is more forgiving; if a team has a bad day on the pitch it won’t severely hurt their chances of winning the ultimate prize, whereas the CL heavily penalizes a team that performs poorly in a given match, especially in the elimination stages. So which competition is the more accurate measure of a team’s performance level? Now that’s a loaded question. In any competition, an essential component in gauging the performance level of a team is the quality of their opponent. I for one believe the EPL is the deepest and most talented league in the world, and if you disagree with me(but I’m confident you won’t), then we’ll agree to disagree on that point. But it’s a difficult argument to say that the EPL is more talented, if not deeper, than the CL. The CL gathers the strongest teams from every major league in Europe, the so called best of the best. Now granted some of the teams in the group stage are soccer tomato cans(yes, I’m thinking of you Hapoel, Braga, and MSK Zilina), but it’s safe to say that even in the EPL, a good chunk of the domestic teams are perpetually a tier(or two) below the perennial contenders. That’s just the reality of domestic soccer leagues; whether you like it or not, the economics of the modern game simply can’t sustain having leaguewide financial parity, which logically leads to a lack of parity on the pitch(On a sidenote, this is true of professional sports league across the world, with the exception of the NFL. If a sporting league truly wants leaguewide financial and sporting fairplay and competition, just duplicate the NFL model, it works). Point is, the CL is more or less the stronger competition, at least in terms of team quality. But is it harder to win the CL or a league title? To win a league title, I roughly estimate that a team needs to play well in 90% of their matches, which equates to about 34 matches in a twenty team league. That’s a lot of games! To win a CL, you have to play well in roughly 10, including the group stage. The numbers speak for themselves, winning a league title is definitely the more daunting task in terms of duration, which by extension is equivalent to endurance. And any athlete knows that it’s difficult mentally to stay focused over a long period of time, unless you’re an ironman like Lampard, who is a horse but also by his own admission acknowledges that he has his up and down days. Peaking at the right time in a tournament like the CL isn’t easy either, but having a countdown, or rather a buildup, can help relieve the monotony of playing an entire season. To win in any sport, or game for that matter, sometimes you need a little bit of luck. The human element is one of the beautifully subjective aspects of soccer; a questionable offsides call, a hard tackle that fails to draw a card, handballs, and whether the ball crossed the freaking plane! It did not! are all examples of this. For Chelsea, lady luck has not been kind to us, to put it mildly. A goal waved off or a handball properly called could have been the difference between Chelsea going for their third CL title as opposed to their first. But that’s sport, and life, and we’re not going to whine about it. Point is, winning the CL sometimes requires a favorable call in a specific moment, and if you don’t get it, the thrill of victory could quickly turn into the agony of defeat. The Special One has said it himself on numerous times, the best team doesn’t always win the CL, but they almost always do for a league title. To provide a different perspective, in America there is a growing trend towards removing the human element, at least with respect to officiating, and relying more on technology to ensure a proper and fair result. Instant replay review, high speed cameras, and computerized sensors are all evidence of this fundamental shift in sporting philosophy. But it’s a hybrid system, and the likely reality is we’ll never remove the human element from sport, nor should we. But to not incorporate any technology at all, like soccer does, is in my opinion shortsighted and arrogant, and in the end bad for the sport. In my defense, as I’m sure you recall, after two blatant missed calls in this past summer’s World Cup, FIFA president Sepp Blatter himself called for instant replay to at least be considered in the future. 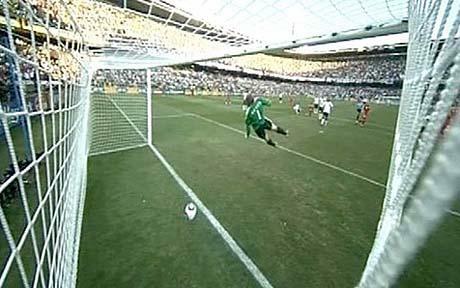 Imagine the worldwide ruckus(or at least in England) that would’ve ensued if Lampard’s missed goal call happened in the final(dream on, at least for now English national fans)? The other aspect of American sporting leagues that merits discussion is the more or less universal incorporation of a tournament at the end of the regular season to determine the season’s champion. In many ways, the CL is more similar to this format; tougher competition later in the season, knockout stages, and a championship match. The honest truth is that having an ultimate match to determine a champion is more thrilling than simply awarding a trophy at the end of year to the team that earned the most points, i.e. Chelsea’s magical and dominating 2005 season, where they won the league title weeks before the end of the season(ducking fellow Chelsea fans’ thunderbolts). And perhaps the most critical point to be made in this entire discussion is that the performance level of a team during a playoff tournament is naturally going to be higher as opposed to during the regular season. As the sayings go, you’re only as good as your competition, and if you want to be a true champion, then you have to beat the best to be the best. Tournaments are the most logical format for ensuring this outcome, which means the CL gets the nod in terms of prestige. So the EPL or CL? It’s hard to say, both are significant accomplishments in their own right, and their fundamental differences makes it an apples to oranges argument(I for one love a good orange, but they seem to be more difficult to come by than a good apple, and there’s nothing more disappointing than a bad orange, although the same holds true for apples). I guess the CL is my soccer orange, at times I yearn for its sweet rewards(I know, this analogy is getting a bit absurd). And the fact that Chelsea won three league titles in the past six years has almost certainly influenced my obsession over the CL. If I could choose, would I take three EPLs or three CLs? I don’t know, I just don’t know! Goddammit, it’s like the soccer fan’s Sophie’s Choice! (FYI, I’ve never watched the movie, I just know about it’s reference in popular culture). Thoughts?